Our Mission: We are servants of God by serving others. We share a responsibility to bring God's love to hurting people. We are an outreach fellowship of believers dedicated to showing the people of the Yucatan Peninsula, through our teaching, actions and love, the life changing power of Jesus Christ. If you have a clothing donation for our children, please give it to Cherilyn for sorting and sizing. We are very happy to report that Cancun Christian Fellowship has received another financial donation from Teresa Weatherly to benefit our children at Casa Hogar para Ninos Esperanza. We always say this but maybe someday it will happen; “Teresa, we hope you join us in the very near future.” Thank you for your continued support and faith in our Mission Outreach. With the financial help of our worldwide Mission Partners, volunteers from Cancun Christian Fellowship purchased and delivered a week’s supply of eggs, cheese, chicken, chorizo, pork, milk and jelly to our Cancun Christian home. Groceries are purchased and delivered every Wednesday. If you would like to make a donation to the Casa Hogar Food Fund, please tell Cherilyn or Tom. We are saddened to report that the Wagner family and members of the Gonzalez family will be leaving our Sunday Service and Christian Fellowship and departing for destinations in the United States. The Wagner’s will be heading back to work and home in Colorado and Trish Gonzalez and her beautiful daughters will be heading to California so the girls can continue their education. It is our understanding that Ricky Gonzalez will remain a part of our group as his work schedule allows. We will miss all of you and hope you come back to us soon. No matter where you are, you are part of our family. 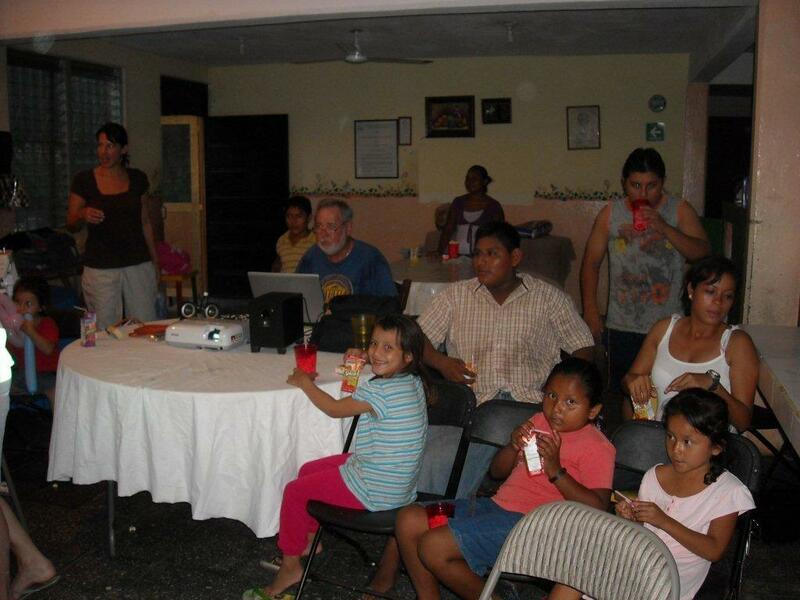 Last week’s Mission Partners work group at our Cancun Christian orphanage was absolutely fantastic. The Hatfield’s and the Hollander’s are amazing families and we are extremely pleased to have them as Mission Partners. Words cannot express our appreciation to them for their work and their fellowship. Henry, Katherine and Santiago assisted but it was clear from the start that our new Mission Partners were in complete control. Thank you and may our Father bless you and all you do in His service. While we are on the subject, we have received inquiries from other Christian groups in the United States that have found and are following our work through our website, blogsite and facebook and desire to join us as Mission Partners in our Christian Mission Outreach. Our Father continues to provide for our children. Remember: This Sunday, July 3rd is our Pizza luncheon at Shakey’s Pizza. We will meet at Malecon las Americas at 1:00. All church members and Mission Partners are invited to attend and there is a playground for the children. Come hungry and have fun with your Cancun Christian family. We hope to see all of you there. It was great having Prince Turner in attendance last week. Prince, we have missed you. Kim Wagner has suffered a mishap with her foot and is currently in pain and experiencing a lack of mobility. Please keep Kim in your prayers. We trust all of you are enjoying our much needed rain. Besides the greening effect and dust control, the rain makes sleeping in a non-air conditioned casa a pleasure. This Sunday’s service will be presented by Mark Shook and Dr. Damon Shook and is titled “The Secret to Satisfaction”. Bring the children and enjoy the Service. Esther Mancilla is out of the hospital and getting as much rest as possible at the home. All will agree that she is a remarkable lady. We ask you to Please keep her in your prayers. A Wednesday Men’s Group is offered by Cancun Christian Fellowship. This week’s lesson is on Christian Fellowship. The men’s group currently meets at McDonald’s McCafe on the corner of Nichupte and Kabah at 8:30. If you would like to join us, please contact Tom Martin at tommartinmx@gmail.com or 998-121-1316 for additional information. A Wednesday Morning Women’s Study Group also meets in Cancun at the Malecon Americas Starbucks. For information, please contact Cherilyn Martin. 998-121-1315 or cherilynmartin@gmail.com . Also, please contact Cherilyn Martin for more information on the Thursday evening ladies’ group. If you have not attended, you absolutely do not know what you are missing. The group meets at California Pizza in Malecon Americas. With the financial help of our worldwide Mission Partners, volunteers from Cancun Christian Fellowship purchased and delivered a week’s supply of eggs, cheese, chicken, chorizo, pork, milk, tomato puree and jelly to our Christian home. Groceries are purchased and delivered every Wednesday. If you would like to make a donation to the Casa Hogar Food Fund, please tell Cherilyn or Tom. Thursday evening, we had the pleasure of having dinner with the Robert Hollander family and the Walt Hatfield family. You will have the opportunity to meet these special families in church this Sunday. It was great having Kathy Turner in attendance again. We all hope Prince is able to join her this week. After church most Sundays, several families get together for lunch and relaxing conversation. If you would like to join us (and we would love to have you), please tell Cherilyn or Tom and they will be happy to give you the current location. These lunches are usually in traditional Mexican restaurants and you will not have to take your banker along to cover your bill. It is an opportunity to spend meaningful time with your family… and yes, children are always welcome. The Pizza Luncheon is definitely on for Sunday, July 3rd. We will meet at Shakey’s Pizza, Malecon Plaza at 1:00. Remember, all church members and Mission Partners are invited to attend and there is a playground for the children. We hope to see all of you there. Titus 2:11-14 For the grace of God that brings salvation has appeared to all men. It teaches us to say "No" to ungodliness and worldly passions, and to live self-controlled, upright and godly lives in this present age, while we wait for the blessed hope - the glorious appearing of our great God and Savior, Jesus Christ, who gave himself for us to redeem us from all wickedness and to purify for himself a people that are his very own, eager to do what is good. We have work scheduled for next week at Casa Hogar Para Ninos Esperanza. The Hollander and Hatfield families will be showing off their painting skills. The final rewards of their work will provide additional income for our Christian home. The Lipp boys continue to keep our children in diapers. Thanks guys. Harry Cuneaz, our newest Mission Partner, has honored us with a financial donation to our Christian home food fund and joined our list of Mission Partners. Thanks Harry, your assistance is really appreciated. The Shawn Bandick family from Playa del Carmen has graced us with another financial donation to benefit our children. Their donation will also go to the food fund. Thanks go out to the Bandick’s for their continued support of our Mission Outreach. This Sunday’s service will be presented by Mark Shook and is titled “A Spiritual Eye Exam”. Mark’s excellent lesson series on “Secrets” is drawing to a close and you don’t want to miss them. Bring the children and enjoy the lesson. Ephesians 2:4-9 But because of his great love for us, God, who is rich in mercy, made us alive with Christ even when we were dead in transgressions - it is by grace you have been saved. And God raised us up with Christ and seated us with him in the heavenly realms in Christ Jesus, in order that in the coming ages he might show the incomparable riches of his grace, expressed in his kindness to us in Christ Jesus. For it is by grace you have been saved, through faith - and this not from yourselves, it is the gift of God - not by works, so that no one can boast. This week’s Men’s Group lesson is titled “Are You Saved” and a lesson that all men should hear and discuss. We hope to see you there. A Wednesday Men’s Group is offered by Cancun Christian Fellowship. Please contact Tom Martin at tommartinmx@gmail.com or 998-121-1316 for additional information. With the financial help of the Sorensen family from Colorado, volunteers from Cancun Christian Fellowship purchased and delivered a week’s supply of eggs, cheese, chicken, chorizo, beef, pork cereal, milk and cookies to our Christian home. Groceries are purchased and delivered every Wednesday. If you would like to make a donation to the Casa Hogar Food Fund, please tell Cherilyn or Tom. The Sorensen’s also delivered clothes and games to Casa Hogar and purchased shoes for several of the children. You met the Sorensen’s in church last Sunday and today, TJ, Cherilyn and Tom had the opportunity to spend the day with Chris, Marce and their four children as servants of God by serving others. This is great news: There were 38 people in church last Sunday, 8 men in today Men’s Group and 8 ladies in today’s Women’s Group. Why not join us? Psalm 46 "God is our refuge and strength, an ever-present help in trouble. Therefore we will not fear, though the earth will give way and the mountains fall into the heart of the sea, though its waters roar and foam and the mountains quake with their surging." We have approved July 3rd for our next Pizza Luncheon. Shakey’s Pizza in Malecon Americas seems to work for everyone and it also offers a playground for the younger children. The last two luncheons have been great fun for all that attended and you get to spend quality time with your Christian family. We hope to see all of you there at 1:00 PM sharp. The luncheon will be open to all church members and Mission Partners. This Sunday’s service will be presented by Mark Shook and is titled “How to Know That You Know”. It is a continuation of Mark’s excellent lesson series on “Secrets”. Bring the children and enjoy the lesson. Additional pictures and testimony should be available on our website in the next few days. We know you will want to see your friends and Christian family having the times of their lives. To share their joy, be sure look at the new Testimony 4 page at http://www.cancunchristianfellowship.com/ . The Lipp brothers were watching over our children again this week and furnished Jamil with diapers. Thanks boys. With your financial help, volunteers from Cancun Christian Fellowship purchased and delivered a week’s supply of eggs, cheese, chicken, chorizo, beef, cereal, rice and beans to our Christian home. Groceries are purchased and delivered every Wednesday. If you would like to make a donation to the Casa Hogar Food Fund, please see Cherilyn or Tom. OK, we are finally moving forward with the “Cancun Christian Fellowship” face book page. New pictures were added this week and all are pictures that do not currently appear on our website. Our momentum in our Cancun English church Sunday service is growing. Thirty people attend last Sunday’s worship service. There were several out-of-town guests including Alex Schmidt, Pierre Crespo, Gavin Penny, Vicki Leonard and Cassandra Campbell. Jim Fox, invited by Tom, Henry and TJ, also attended our Sunday English church service. With any luck, Jim will become a regular. We have been blessed with a Casa Hogar site visit and donation benefiting our Christian Mission Outreach. The Jon Green family (Jon, Kristi, Jared and Kaylin from Spokane, WA) visited our children’s home last Saturday, brought games, books and other entertaining material for our children and presented us with a donation to assist in our weekly food purchases. It was a sincere pleasure spending time with the Green family and we look forward to seeing them again in the near future. Please see pictures of the Green’s visit on our face book page and join us in welcoming them to our Mission Outreach worldwide family. After church on most Sundays, several families get together for lunch and relaxing conversation. If you would like to join us (and we would love to have you), please tell Cherilyn or Tom and they will be happy to give you the current location. These lunches are usually in traditional Mexican restaurants and you will not have to take your banker along to cover your bill. It is an opportunity to spend meaningful time with your family… and yes, children are always welcome. Don’t forget to put the middle of June on your calendar if you would like to join us in manual labor at our Cancun orphanage. All you need is gloves, jeans, foot protection and compassion to make a difference in the lives of others. Talk to Tom for additional information. We are considering July 3rd for our next Cancun English Church Luncheon. The date falls on Sunday and it is 4th of July weekend. We will keep you posted as arrangements progress. The last two luncheons have been a great success and a wonderful way for our Christian family to get together for good food and great conversation. Shakey’s Pizza in Malecon Americas seems to work for everyone and it also offers a playground for the younger children. We hope to see all of you there. The luncheon will be open to all church members and Mission Partners (that covers approximately 150 people). It was truly nice seeing Harold, Tracy and the boys back in Cancun and in our Sunday English service. Welcome Home Chapman family! This Sunday’s service will be presented by Damon Shook and is titled “You Are Invited”. We have previewed the lesson and feel you will enjoy it. We always appreciate Damon’s “Old School” delivery of our Sunday message. Juliette’s parents from Michigan, Garry and Carolyn Mudge, were in our Cancun English church service Sunday and it is always good seeing them. We hope they join us again in the near future. Cancun Fellowship Church, Companerismo de Cancun, Cancun Christian Fellowship, Carpe Diem Yucatan SA de CV, Cancun Christian Church Services, Cancun Christian Men, Cancun Christian Women, our Cancun Christian Orphanage and Cancun Christian Mission Outreach all Serving God by Serving Others.